Check out one of the leading all terrain tires on the market - the Tensor Regulator! 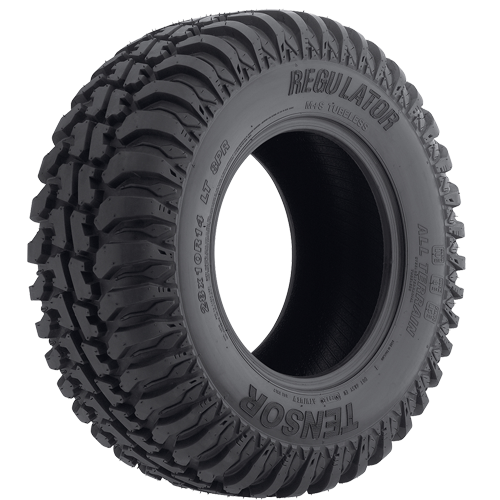 Its thick 8-ply construction and tread design based off of truck tires makes the Tensor Regulator the best All Terrain tire available! The Tensor Regulator tire is one of the strongest all terrain tire on the market today. Along with its thick 8-ply construction with a nylon reinforcement layer, it features steel belts on both the inner and outer beads. Its engineered based off of a truck tire which gives you a wider footprint to provide better handling and braking in any conditions. The Tensor Regulator features an aggressive looking all terrain design to provide a smooth, quiet and comfortable ride in all terrain. Its deep shoulder lugs are great for improved corner traction.